Melatonin is often suggested as a remedy for those of us who have N24 or DSPS. It works for some people, but not for others. (So far I seem to be in the latter category.) For some people it doesn’t work because — well because it doesn’t work for them — we can’t always tell why. But for other people it does not work because they are using the wrong dose. Melatonin dosing can be a bit tricky. When speaking of hormone dosing, there are two terms that often arise: physiological dose and pharmacological dose. The physiological dose of a hormone is the dose the replicates the level of the hormone normally found in the body. For example, people with Addison’s disease, a deficiency of the hormone cortisol, will usually take 15 to 25 mg of cortisol a day, which results in a serum level of cortisol similar to that of a healthy person. Another phrase to describe the physiological dose is the “replacement dose” which means essentially the same thing. The pharmacological dose of a hormone is the dose required to produce a specific desired effect. In some cases the pharmacological dose is much higher than the physiological dose. Cortisol for example has an immune system suppressing effect at high doses, so people with auto-immune conditions are often prescribed cortisol (or cortisol analogs) in much higher doses than the replacement doses used for Adddison’s disease. There is nothing necessarily wrong with using such high doses. They are often the best treatment for a disease. But they do have a much greater risk of side effects, since you are introducing a hormone at much higher doses than the body is used to. Melatonin is a hormone produced at night, and in humans aids in consolidating sleep at night. As such melatonin can have a sedative effect. Melatonin levels during the day are very low, typically 1- 10pg/ml, and often undetectable. At night melatonin levels rise to much higher levels, usually 40-100 pg/ml or roughly 10 to 40 times the daytime level. You will often see recommendations to take melatonin doses at night of 3mgs. Such a dose of melatonin will not only produce levels much higher than the daytime levels, but will produce levels much higher even than those found normally at night. If the nighttime level of melatonin is around 10-40 times that found in the day, 3mg of melatonin will produce levels approximately 10-40 times higher than even the nighttime levels (or over 100 times that normally occurring during the day). The serum level would be around 1000 pg/ml. Why are such high doses suggested? One reason is because this high dose maximizes the sedative effect of melatonin. For most people the more you take the greater the immediate sedative effect. This is a pharmacological dose — it is maximizing the effect of a hormone by taking very large doses that produce a drug-like effect. Well, what’s wrong with that? If you want to get to sleep don’t you want to maximize the sedative effect? Well, maybe, maybe not. You see in the treatment of N24 or DSPS a sedative effect is not the whole answer. If it were then any sedating pill could treat these conditions, and that is not the case. Most sedatives in fact don’t work very well for circadian disorders. What we are looking for in using melatonin is a phase shift in the timing of sleep, not just an acute sedative effect and for that too much melatonin can be harmful. Melatonin taken in the evening produces a phase advancing effect, while melatonin taken after the midpoint of sleep (roughly) produces a phase delaying effect. Keep in mind that melatonin taken orally has a half-life in the blood that can range from 30 minutes to 2 hours (depending on the individual and the study method). If you take 3 mg you are getting blood levels in the evening that are extremely high and it’s going to take many hours for those levels to get back down. And that’s the problem. You will still have melatonin in your system the next morning, when it will produce a phase delay. This spillover effect is nicely illustrated in a graph produced by Lewy et al in a study which showed the advantages of lower doses of melatonin. They found they could entrain a blind patient to 24hrs with 0.5mg of melatonin but not with 10mg. 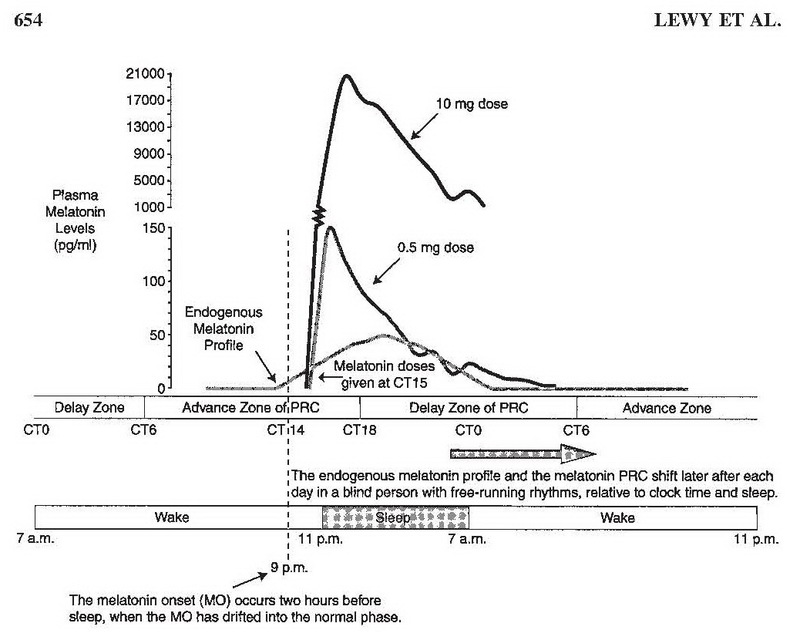 As one can see from the graph this is because the 10 mg dose caused melatonin levels to remain elevated during the phase delay portion of the phase response curve (PRC). In addition to the spillover effect from high doses of melatonin, the immediate sedative effect of a large dose can cause other problems. With any kind of sedative the phenomenon of acute tolerance can occur, which means as the sedative effect wears off later in the night the person may find themselves awakening again in the middle of their normal sleep period. There may be some individuals who need high doses of melatonin because they are insensitive to its effects or they require an acute sedative effect. I would not discourage anyone from trying higher doses. But if a higher dose doesn’t work or causes problems, consider going low dose. That’s the point of this post. Will these lower doses of melatonin work for you if you have N24 or DSPS? I wish I could promise they will. For some people they do work or at least help. They are often helpful for blind people with N24; less so for sighted people. But for many others melatonin does not work. There are several possible reasons. Taking melatonin early in the evening produces the equivalent of a very long winter night and this can result in depression-like symptoms in many people. It may also be that the spillover effect of melatonin is more pronounced in some people. It also may be that the underlying cause of N24 or DSPD in many people has nothing to do with melatonin itself, and therefore manipulating melatonin levels accomplishes nothing for them. I know that melatonin often makes me feel very tired and lethargic the next day — not what I am trying to achieve, needless to say. Lately I’ve been experimenting with even smaller doses. I put around 125mcg (0.125mg) of melatonin in liquid form in a glass of water and sip small amounts of it for an hour or two before bed. I probably get only around 25-50mcg (less than half a glass) in total. I’m not sure if this is helping yet (and even such a low dose may have made me more lethargic at times). But while I can’t promise melatonin will work, if you are going to try it you are better off trying the right dose. At the right dose it may work, and at least if it does not you work will know that melatonin is not the answer for you, not that you just took the wrong dose. Remember, for melatonin less is (sometimes) more. Posted by LivingwithN24 (James Fadden). I just found out today that I probably have DPSD. Of course I knew I had it since I can remember. Even in the 1st Grade I couldn’t wake up on time to save my life. The only time in my life I ever felt “sleep normal” was when I worked a swing shift form 2pm to 12am. Welcome and thanks for commenting here. Congrats on learning that it has a name — what a relief, huh? Learn what you can about it, join the mail list at the site linked to the right, look at forums such as TalkAboutSleep. Then decide if you want to live with your circadian rhythm disorder as before or try for the formal diagnosis and the treatment (management) possibilities. Good luck. Don’t feel bad that it took you a long time to find out what you have. That’s the case for most people with circadian disorders. We all try for years to fit in with the rest of the world. Awareness of DSPD is not very widespread — although it’s slowly getting better. The Nite Owl mailing list at the circadian disorders site is a great source of support. Here is an interesting article from the New York Times with a description of treatment using micro-doses of melatonin. This is very interesting to me since I regularly take 12mg (yes 4 sub-lingual tablets) and I find that this becomes increasingly unreliable over time. I’m doing fine on Melatonin – I was taking 2 mg but not getting much effect from it, but I’ve been on 4 mg for a good few months now and it gives me an extra few hours in the day, which makes all the difference. I’m a long-time sufferer of DSPS, and I’ve recently found a simple cure. Like you, I’ve been living with the problem for years and doing amateur research and simple experiments to try and manage the problem, to no effect. After reading about the retinal-ganglia, it occured to me that perhaps indoor artificial lighting is tricking the pineal gland into thinking it’s still daylight. Since it takes several hours of darkness before the pineal gland starts producing melatonin, staying indoors after sunset delays that process. As an experiment, I’ve started wearing red-tinted wrap-around sun glasses 2 hours before bedtime. I can still work, read, watch TV and all that, but the glasses mask off the blue frequencies, telling the brain that the sun has gone down. It had an almost immediate effect. I’m a long-time sufferer of DSPS who has tried everything, but wearing the glasses fixed the problem in the first week. I’m also a lot more “peppy” during the day, and I wonder if long term exposure to late-night artificial lighting (and low level during the day) is a cause of depression. Depression meds take about 6 weeks to have an effect, so I’m guessing that it would take about 6 weeks for the glasses to have an anti-depressive effect as well. I’m on week 3 with the glasses. You can get good wrap-around red tinted glasses at a motorcycle shop for $12. WalMart sells an “old grandpa” set for $25 which will go over your existing glasses. It has to be wrap around so that no light gets in over the edges. You don’t want polarized lenses because they will interfere with LCD viewing. You want red tinted and “blue blocker”. Oh, and make sure they’re comfortable. If you have to take them off for any reason (such as scratching your nose), you have to remember to close your eyes. It takes a couple of hours of dark before the pineal starts producing melatonin, and I strongly suspect that a short burst of light will reset that internal timer. If you try this and it has any effect, positive or negative, I’d like to hear about it. Contact me through my website (below), I’ll collect and post all the anecdotal stories so we can see if there really is an effect. Negative data is important, so if you try it and find no effect, I’d like to hear that as well. to CM: Thanks for the NY Times reference. It seems the usefulness of microdoses is becoming more widely known. It’s a good article although it would have been better if it acknowledged that all circadian disorder patients do not respond as well as those described. to Penny: It’s not unusual for people with DSPS or N24 to have days where they sleep for a very long time. Usually this is due to accumulated sleep debt caused by reduction of sleep on other days of the week. There can be other reasons such as internal desynchronization, which I hope to discuss in a future post. Red or orange or blue-blocking goggles as well as red or orange room lights are an important tool in treating DSPS and N24. The degree to which they work varies a lot from person to person. Some people have gotten complete relief from that approach. Others have reported little or no benefit. I am in the middle. I use orange goggles and red or orange room lights in the evening. It does help me maintain a 24 hour schedule for longer than otherwise possible, but it’s not completely effective for me. I am glad it works so well for you. It’s definitely one of the things that folks should at least try in order to see if it works for them. I’m firmly convinced that 3mg is way too much and 1mg is pushing it for most people. Melatonin is a powerful metabolic regulator. Pouring it in by the bucketful is probably a bad plan and definitely leads to much worse side effects. I have DSPS (preferred cycle usually about 4am til noon) and have, after finally going to the sleep docs and being told that everything I already knew is correct and only good old-fashioned self-discipline with light management (bright in morning when I get up early enough, nice and bright all day — I worked in a cave of an office and the lights I installed are keeping me much more alert but they’re practically addictive now), then dim + blue-blocking glasses in the evening; keep to a bedtime schedule; and, microdose melatonin. I don’t have the articles up currently but was just doing some research on this. Melatonin has the strongest phase-advancing effect when delivered 5 hours before bedtime AT A REASONABLE DOSE which does not spill over into the morning. I don’t remember exact figures but I believe most of the articles I’ve read that saw consistent effects maxed out at 1mg, with most much lower. In order to MAINTAIN your phase once you’ve achieved a good one, microdose melatonin should be delivered 2 to 4 hours before bedtime — you’ll need to experiment. I used to take 250mcg (0.25mg) but it tended to knock me the hell out within an hour. I may be very sensitive though — not only am I on beta blockers, which mess with melatonin secretion, but I’m kind of skirting under the line of bipolar, and studies suggest that bipolar, SAD and sleep phase disorders may have a common root in light sensitivity. Anyway, I’m currently at about 150mcg (0.15mg) at about 4 hours before bedtime. I still get some side effects in the initial few days, notably my stomach doesn’t feel too good for about an hour after I take it, but then about 4 hours later, when I want to be going to bed? I start getting sleepy! And I can get into bed and often go right to sleep! This is in combination with morning bright light therapy and regulating my light levels all day, but, early on it’s a big success so far. I’ve considerably reduced my dependence on sleeping pills. J Clin Endocrinol Metab. 2011 Mar;96(3):E463-72. Epub 2010 Dec 30.
shortens melatonin duration in humans. E, Zeitzer JM, Czeisler CA, Lockley SW.
And vaguely related, this shows considerable non-drowsy activity in suppressing daytime temperature at very small injected doses (10-30ug), perhaps supporting the notion that people shouldn’t be eating 3mg? Am J Physiol. 1999 Feb;276(2 Pt 1):E249-54. van den Heuvel CJ, Kennaway DJ, Dawson D.
Eur J Clin Pharmacol. 1999 Apr;55(2):111-5. Influence of beta-blockers on melatonin release. Thank you, G Money, for your very interesting comment. This article prompted me to try low (0.3 mg) dose melatonin. This is my story. I am aged 55 and have had problems getting to sleep at a normal time for thirty years or so. I have just lived with the problem and accepted it. Typically it would take me until three in the morning to get to sleep. My 20 year old son has recently developed similar difficulties and has seen a specialist, who recommended 3-6mg dose melatonin 1 hour before bed. After much experimentation, my son has found 6mg immediate release and 1mg slow release is ideal for him. It really has worked wonders. However, I tried 1mg then 3mg, but this kept me awake seriously and I wasn’t at all comfortable with the physical effects that I had with this dose. I was therefore somewhat disappointed that melatonin perhaps was not for me. That is, until I read this article. I purchased 0.3 mg immediate release and gave it a go, taking it at 9pm (2 hours before bed). With this dose I feel no noticeable sleepiness effect. However after a week or so I noticed that I nodded off immediately after going to bed at 11. I now have a desire to go to bed at 10 even though I do not feel really tired. (Perhaps this is the novelty of going to sleep quickly). I go to sleep almost straight away. I am convinced the low dose melatonin has had a positive effect on my sleep problem. My only thought now is – should I stop taking it in the hope that my sleep phase issue is cured or should I keep taking it forever? I guess I need to experiment. Wonderful that our article has actually helped you! And you have the right attitude: we need to experiment to find out what, if anything, works. Yes, TM, it’s great to hear this! And as delayed2sleep says, only experimentation will tell you for sure if your problems are permanently cured. Without the melatonin you might still have some tendency to drift later over time, but whether that happens within days, weeks or months remains to be seen. I am interested in using very low dose, time release Melatonin for day time use. A series of studies in Russia, starting in 1999 and as recently as 2011, have looked at the the relationship between daytime MT levels and a condition known as ‘Sampter`s Triad’, or ‘Aspirin Sensitive Asthma’. They have found that persons suffering from this condition have very low, almost undetectable levels of MT being produced in the daytime. As one who has this condition, I am interested in trying very low dose 8-hour , time release tablets , on a daily Basie, to see what effect it has to improve the quality of my life, and of others who have this condition. So the question would be, what amount of Melatonin should I have my Compounding Pharmacy put into 8-hour time release tablets, to replicate the normal daytime production of a normal person ?? I am a bit skeptical of the likely efficacy of such an approach since nighttime asthma attacks have also been linked to the secretion of melatonin. And as asthma is a serious condition I would not try to self treat it without a doctors advice. However, to answer your dosage question, daytime melatonin levels are about 1/8 those at night, although this varies quite a bit in different studies and in different patients. Since a night-time dose of 100 to 200 mcg is usually considered physiological, a dose for daytime use might be 12 to 25 mcg. But this has never been actually tested, so that is just a guess. And once again, this is not intended as medical advice and any asthma treatment, even one seemingly innocuous like low dose melatonin, should only be done after proper consultation with a doctor. You’re welcome. Good luck with your treatment! Let us know how it goes. EXCELLENT post. Thank you. It’s crazy, an extremely well-reputed and well-credentialed doctor had me experimenting with various pharmacological doses of melatonin for years, to no avail. I was having the exact problems you’d outlined: waking up after a few hours due to acute tolerance, exacerbating my DSPS due to the long clearance of such large doses, etc. This post first got me researching low doses of melatonin. The research and theory is sound, and even better, it works incredibly well! Question: What are your preferred sources for low dose melatonin? It’s so hard to find melatonin at lower doses. Currently, I’m using liquid melatonin, but instead of taking the dropperful of 30 drops (3mg), I just take 2-3 drops. Titrating accurately seems difficult. As it is, supplements are notorious for having inaccurate doses / concentrations. If you add in the high concentration of melatonin, and that you need to shake the liquid well to properly mix, it seems like a recipe for awfully variable doses. Puritan’s pride makes a 200 mcg melatonin tablet and Life Extension makes 300mcg capsules. Amazon carries them both. I just had my daytime level of MT checked, at 9:00 AM in the morning. The result came in with 48.0 pg/mL with normal range for my age of 11.0 to 134.4 pg/mL. I am the guy who had a auto-immune type of Asthma, called Sampters Triad, or Sprain Sensitive Asthma. With this condition, there is a malfunction of the processing of inflammatory chemicals in the body, and some research had shown that folks with this condition have low day levels of MT. So my doctor is going to prescribe a very low replacement does, in a 8 hr time release compounded tablet, to try to raise my daytime level to about 100.0 pg/mL. I’m Mirj, 23 years old from Bern (Switzerland). Since january I know that I have DSPS from childhood on. The doctors immediately gave me melatonin (at 18:00) and seroquel (neuroleptica with side effect that it makes very tired, at 20:30) and they fixed my bedtime from 0:00 to 07:00. In the morning I had light therapy. The first 2 weeks it worked. It was as a wonder. Then I overslept nearly every day (just 1-2h) and needed more time to fall asleep in the evening. So they doubled the medicaments and the light therapy. And it worked again for 1 week. Then the same problem. After 6 weeks the light terapy was useless, so they stoped it increased the medicaments again. And every time again. Now I take 4mg Melatonin and 200mg seroquel. I sleep from midnight to noon. I’m forgetful and sometimes (2 or 3 times) i forget to take the seroquel, than I can’t sleep until 8:00. My doctors want that I continue to take the medicaments and try to sleep from 0:00 to 07:00 cause they mean that they see a good advancement from this therapy. Is this normal? How long it takes to fix the rhythm? I can’t work because of mental-health problems (safe assumption: for the next 4-5years). Wouldn’t it be the better strategy to fix me on my natural rhythm? I never sleeped with my natural rhythm and I would like to see how it would be. I asked my doctors and because of this question they said that I would not show enough motivation to fix my rhythm to rhythm of the society.. I gave my best my best to keep the bedtimes ( Wake-up light, radio (human voice) and 4 alarm clocks (in rotation system)), I drank no alcohol, no party, went to bed at 0:00 every day (3 times 1 hour earlier because the seroquel makes me very tired…). What’s my mistake? In your situation it might make sense to sleep on your natural cycle if you are not going to be working or have other need to be up early. Bearing in mind that I am not a doctor, unless you need Seroquel for other reasons, the dose you are taking is much too high and probably is what is responsible for the failure of treatment. It is a very sedating drug that lasts in the body for many hours even the next day. And tolerance tends to develop to the sleep-inducing effects so it does not always help for sleep in the long run. So it won’t continue to help you get to sleep but will often still make you tired the next day. If you do need Seroquel for other reasons, do not stop taking it; but from the point of view of your circadian rhythm it is not going to help. If you do decide to shift your sleep earlier, light in the morning and melatonin and avoidance of light in the evening have a good chance of working, although success is not guaranteed. The important thing is to do the advance *very* slowly, for example by 5 minutes a day. One can’t suddenly shift from getting up at noon to getting up at 7am. It takes many weeks. I don’t need the Seroquel for other reasons. thanks for the informations. I’ll retalk to my doctors. According to a 2003 paper here, http://www.jacionline.org/article/S0091-6749(03)01717-2/fulltext , people with nocturnal asthma should carefully consider whether they want to use melatonin supplementation at all. The study found that people with nocturnal asthma have, without supplements, higher than normal levels of melatonin at night. It is reported that high levels of melatonin are pro-inflammatory in asthma. This is, at the least, another argument for using the smallest effective dose of melatonin. Just FYI… I found this post life-changing. I had just figured out what DSPS was and had already tried every other sleep intervention over the course of my life. Even melatonin only seemed to work semi-OK. Well, when I went down to the really low dose, my world transformed. Had my first night of sleep where I fell asleep tired, slept through the night and woke up refreshed. Now, after 30+ years of bad sleep (even in childhood) I’ve had 6 months straight of basically perfect nightly sleep. Wow, we loves us a success story, norcim133. Thanks for commenting! I also have the nagging suspicion that giving into the sleepiness and having an early nap just makes things worse. I had actually sworn off melatonin for this reason, but thinking about trying it again while forcing myself to stay awake until target bedtime. Have you tried tart cherry juice? It contains natural melatonin and because it is in food, it is probably metabolized differently (and may not cause the sleepiness, next day.) I think goji berries are also high in melatonin, but check. I’m not positive of that.